Lepidozamia peroffskyana – Wholesale Nurseries. Lepidozamia peroffskyana is a Cycad native to New South Wales and Queensland. 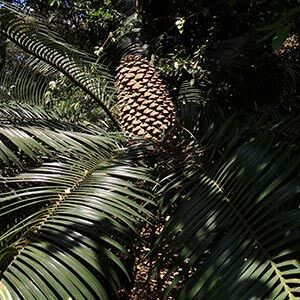 This is a large but slow growing cycad that can reach 5m over time. Tall arching fronds with a soft fern like look make it a most attractive, if unusual landscaping plant. Commonly given the common name of ‘ Burrawang’ or ‘Pineapple Zamia’ and also known as the ‘Scaly Zamia’ the long fronds remind us of those of a palm tree. However this is a cycad, rather than a palm tree, over time it will form a trunk and can reach 5m in height. The trunk may not develop for a number of years, so in these terms Lepidozamia peroffskyana has a very slow growth rate. Foliage is faster to develop and it is for the wide spreading foliage that Lepidozamia peroffskyana is so widely used as a landscaping plant. Suited to growing in a container and best in part shade, this species will grow as far south as Melbourne and does require a well drained soil. 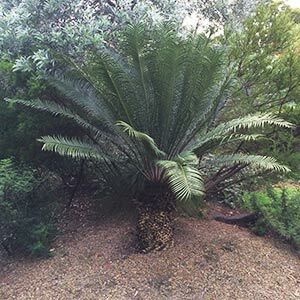 Some excellent specimens can be found in the Botanical Gardens of Melbourne and Sydney, however some of the best are in the Maranoa Gardens in Melbourne. Mature specimens with wonderful trunks as well as good foliage make outstanding feature plants. Smaller plants are also widely sought after for the foliage effect. Foliage – Arching green to 3m in length. Growth Rate – Slow in height, foliage is moderate to fast. Drought tolerant – Yes, however best with some extra water during long dry spells. Features – The large cones of the female plants that ripen to exude red berries. Lepidozamia peroffskyana is available for sale from the following participating wholesale nurseries.